If you’re like me, you receive tons of amazing Holiday Cards and keep each and every one of them. I keep them all in stacks of shoe boxes and when Christmas comes along, I take out certain ones and display them. I found another amazing idea that you can do with all the Holiday cards you receive every year. Gather all your Holiday cards and simply take your hole punch and line the card up so that it punches just the TWO holes evenly on the card. 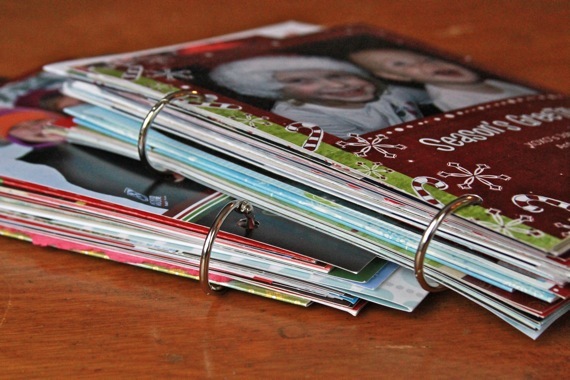 Display them on your coffee table during the Holidays so that guests can flip through them. This is such a great idea. I have started doing this with the birthday cards my sons receives for his birthday. I think it ‘ll be a great memento to pass onto to him when he’s older. What a great idea! I wish I had of thought of this before. I never know what to do with the cards! I am definitely going to do this this year! I LOVVVVVEEEEEE this idea. Now I’m pissed that I threw away all of our old cards. Damn show about hoarders. I’m definitely stealing this idea from now on. Thanks!